Archey’s frog is a survivor: virtually unchanged evolutionarily for 150 million years, the species has survived the comet that decimated the dinosaurs, the Ice Age, and the splitting of continents. Seventy million years ago New Zealand broke away from Australia, essentially isolating Archey’s frog and its relatives from all predatory mammals. Yet, if the New Zealand government has its way this species may not survive the century, let alone the next few decades. Archey’s frog is a survivor: virtually unchanged evolutionarily for 150 million years, the species has survived the comet that decimated the dinosaurs, the Ice Age, and the splitting of continents. Seventy million years ago New Zealand broke away from Australia, essentially isolating Archey’s frog and its relatives from all predatory mammals. Yet, if the New Zealand government has its way this species may not survive the century, let alone the next few decades. The New Zealand government has put forward a controversial proposal to begin opening three of the nation’s protected areas to mining: Great Barrier Island, Paparoa National Park, and Coromandel Peninsula where the last populations of Archey’s frogs live. According to critics, the government’s proposal could push Archey’s frog toward extinction, while negatively impacting a number of other endangered species, beloved wild lands, and a nation driven by tourism. 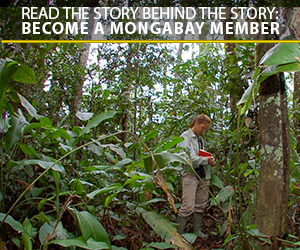 The conservation program EDGE considers the Archey’s frog to be a truly one-of-a-kind species. In fact, it is the organization’s top amphibian. 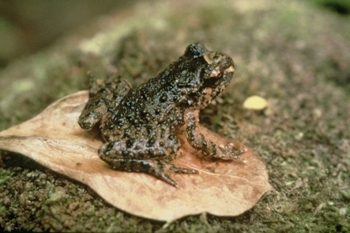 Archey’s frog (Leiopelma archeyi). Photo courtesy of Phil Bishop. EDGE’s number one mammal, the baiji or Yangtze River dolphin, has already likely succumbed to extinction, and the organization is anxious not to lose the world’s number one amphibian as well. A number of traits distinguish Archey’s frog: it has an additional vertebrae, cartilage in the abdomen, no ear drums, and has muscles for wagging a tail, but no tail. This last feature is likely a relic from its ancestor amphibians who once sported tails. They also squeak instead of croaking. In addition to unique traits, Archey’s frog does not give birth to tadpoles like most frog species; instead the tadpole stage happens in the eggs. New Zealand’s Coromandel Peninsula could be opened up to mining, if the federal government has its way. Although a population of approximately 40 Archey’s frogs is kept at the Auckland zoo and the University of Otago, this rare species has proven tremendously difficult to breed in captivity. “Despite years of work at these (and other) facilities, very few froglets have ever been produced and only one froglet has ever been raised to adulthood,” Kevin Buley of the Auckland Zoo says, adding that very little is understood about the embattled species. “For example, we still cannot reliably differentiate between the sexes of live frogs. Husbandry procedures are constantly being refined but we could still be years away from being able to reliably breed the species in captivity,” Buley explains. He says that working with the number one EDGE amphibian is a “privilege and a unique opportunity”, but also “incredibly challenging”. Named as EDGE’s number one amphibian means that Archey’s frog is not only an evolutionary treasure—representing the ancient origin of all modern frogs —but is also on the edge of extinction. Struck by disease, alien predators, and climate change the IUCN Red List currently classifies the frog as Critically Endangered. Still the species survives—if not thrives; but conservationists are deeply concerned that the New Zealand government’s plans to open up three protected areas, all classified as Schedule Four, to mining would further imperil Archey’s frog as well as other endangered flora and fauna. 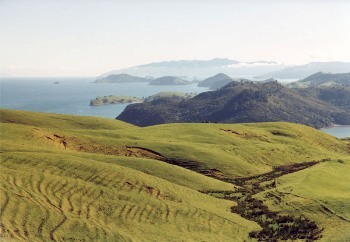 Otahu Ecological Area in the Coromandel-targeted for mining. Photo courtesy of Forest and Bird. Bishop says that due to their natural history, Archey’s frogs are not conducive to change. Vallance says that the mining in the parks is likely to be open cast mining since the minerals are not found in dense quantities. Such mining would be particularly devastating to the environment as it requires removing all the rock, soil, and vegetation. Martha mine in Waihi, New Zealand. Photo by: Kim Westerskov. Currently, one third of amphibians are threatened with extinction and 120 species are thought to have gone extinct in just the last thirty years, leading many herpetologists to warn of an impeding amphibian mass-extinction. The proposal to mine in protected areas is a new development in New Zealand put forward by the current administration, headed by Prime Minister John Key. “I believe the John Key government will prioritize the interests of the extractive industries with whom they have a relationship over the interests of New Zealand as a whole,” Member of Parliament Metiria Turei told mongabay.com. MP Turei is the co-leader of New Zealand’s Green Party. True to Vallance’s words, New Zealanders are not taking the government’s plan lying down—far from it. 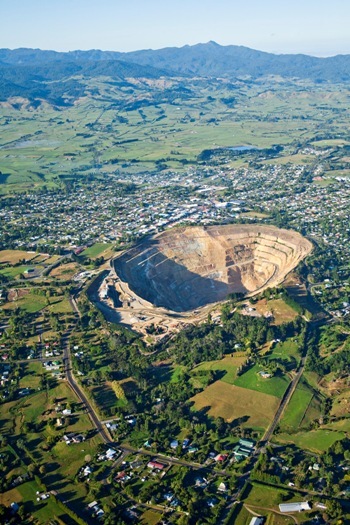 On May 1st 40,000 New Zealanders turned out in a march against the proposed mining. The march was called by the New Zealand Heraldas the ‘biggest in a generation’. Archey’s frog in the wild. Photo courtesy of Phil Bishop. New Zealanders didn’t just march to save a frog according to Nicola Vallance; they marched to protect beloved wild lands, their green reputation, and their most important industry. “New Zealanders are fiercely proud of their National Parks and other protected areas—not the least of which because these areas form the basis of our internationally renowned ‘clean and green’ image for tourism, which is our highest earner, bringing in around $21 billion a year,” explains Vallance. In addition to the protest, this week 35,000 submissions were sent to the federal government regarding the mining issue. Prime Minister Key, in reaction to the flood of submissions, said they government would “reflect on what we’ve learnt.” According to local news sources the government has begun considering cutting the area to mine in half, but such a plan would still involve mining in conservation areas. Archey’s frog has become the media star for the fight to save these conservation areas, but this is not the only species that would be impacted by mining, nor the only frog. Archey’s share their the Coromandel region with Hochstetter’s frog (Leiopelma hochstetteri). Only four frog species are native to New Zealand, making the Coromandel Peninsula conservation area home to 50 percent of New Zealand’s frog species. 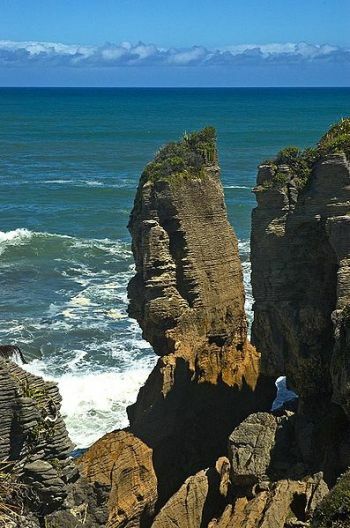 ‘Pancake rocks’ in Paparoa. Photo by James Shook. Closely related to Archey’s frog, “Hochstetter’s frogs are slightly more aquatic as they are found at the edges of streams and under stones in stream beds. They also have slightly webbed back feet and have a ‘tadpole’ stage that is almost free-living. They are also more robust in stature than Archey’s and very slightly bigger overall,” Bishop explains. Currently, Hochstetter’s frog is listed as Vulnerable to extinction by the IUCN Red List, though if mining occurs near or in their habitat that classification could be raised. Vallance explains that mining in Coromandel peninsula could also impact a large population of kiwis, long tailed bats, and freshwater species. On the west coast of the South Island, Paparoa National park is home to an endangered fern species Asplenium cimmeriorum that was only discovered in the 1990s. As well, the peninsula is important for many bird species, including great spotted kiwi (listed as Vulnerable), kaka (Endangered), kereru (Near Threatened), weka (Vulnerable), and yellow-crowned parakeets (Near Threatened). “The forests [of Paparoa National Park] are crucial for feeding and sheltering in colder months for birds that live higher up the ranges at other times,” says Vallance. Hochstetter’s frog. Photo courtesy of Forest and Bird. The stand-out species for the third park, Great Barrier Island, are the chevron skink (Vulnerable) and the brown teal (Endangered). In the end whether or not Archey’s frog (and the wild lands of Paparoa, Coromandel, and Great Barrier Island) will be allowed to survive unscathed will not be decided by biology—i.e. evolutionary processes—but human politics: a fickle and often myopic occupation indeed. Yet from tens of thousands of protesters, outcries from both scientists and leaders, and a flood of public submissions, it is clear that in this case at least the citizens of New Zealand are on the frog’s side.